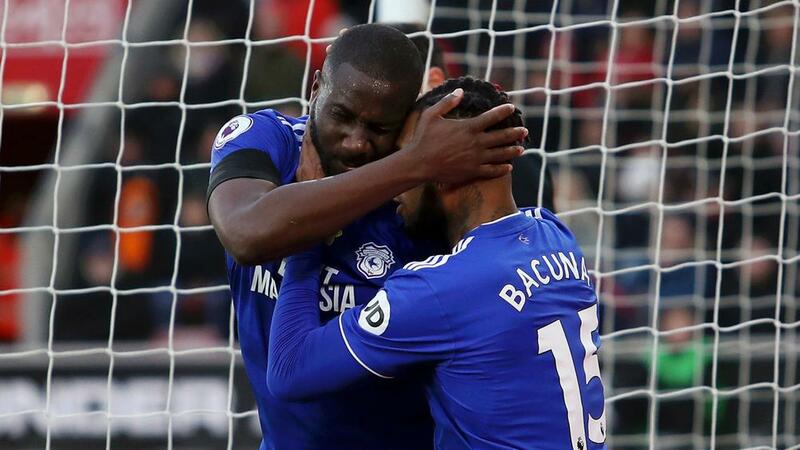 Cardiff City stole an incredible 2-1 win at Southampton after stoppage-time goals at either end saw the visitors complete an emotional week outside the relegation zone. The Bluebirds looked to have been denied at St Mary's as their supporters chanted the name of club-record signing Emiliano Sala throughout the first match since his body, discovered in plane wreckage in the English Channel, was identified. Sol Bamba's scarcely deserved opener was cancelled out by Jack Stephens in the 91st minute, but Cardiff still had time to rally once more. Substitute Kenneth Zohore prodded a tame effort past stranded goalkeeper Alex McCarthy, allowing Neil Warnock's men to celebrate an improbable triumph that sees them leapfrog Southampton and move up to 15th.